Block Island, Rhode Island, was recently praised by The Nature Conservancy as “one of the 12 last great places in the Western Hemisphere.” If you love beaches, and you can travel to the northeast United States in the summertime, then check out Block Island, and find out why it earned such high praise from The Nature Conservancy. Because when it comes down to it, Block Island is all about the beaches, the ocean, and the sky. 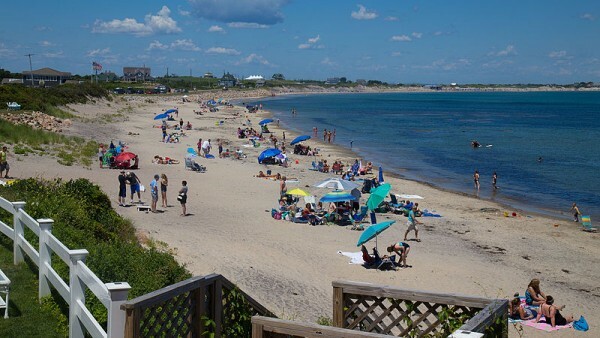 Located about 12 miles out into the Atlantic, off the coast of Rhode Island, of which it is a part, Block Island has only one town, New Shoreham. It is the smallest town in the smallest state in the Union. 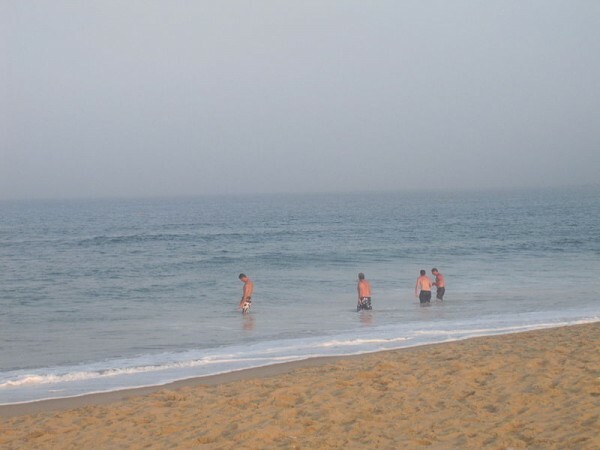 But there is one thing about Block Island most definitely not small, and that is the beaches. More than 40% of Block Island is protected land. With just one town, and few roads, a trip there is like stepping back in time. The pace of life is slower, more relaxed. It’s an attitude actively promoted by the local denizens. Some of the hotels and B & B’s on the island take pride in ensuring there are no clocks or radios in guest rooms! Most of the commercial activity, such as it is, takes place in and around New Shoreham. Visitors, for the most part, travel around the island, beach-hopping, via bicycle or moped. Admission to the beaches is free everywhere on the island. There are beaches for every taste and mood, from Pebbly Beach, with its sunbathers and swimmers, to Crescent Beach, with its shallow, sandy bottom and gentle surf, to Scotch Beach, for the more trendy beach set. And all over the island, there are beaches where you can walk a short distance and find yourself completely alone, with just the ocean and sky for company. Surprisingly, Block Island exudes all this natural beauty, while at the same time offering sophisticated but relaxed hospitality to its visitors. A variety of accommodations, noted for their old world charm, await the traveler. There are Victorian-era hotels that are beloved historic landmarks, cozy B & B’s, picture-postcard cottages, charming guest houses, and private rentals. What you won’t find on Block Island are any hotel chains. The oldest hotel on the island, at about 150 years old, is the revered Spring House Hotel. This magnificent, historic building has played host, over the years, to Ulysses S. Grant, to Mark Twain, and to a Kennedy wedding. And on the edge of town, atop a hill overlooking the harbor and offering spectacular ocean vistas, sits the gorgeous Atlantic Inn, which opened its doors in 1879. The Atlantic Inn boasts 21 individually-decorated guest rooms, filled with antiques. For visitors with high gastronomical expectations, the fine, landmark hotels set lofty standards in their cuisine, taking pride in featuring local produce and locally-sourced seafood. In town, meanwhile, several eateries cater to the more casual diners, and lobster, clams, and chowder are ubiquitous and excellent. When your beach-day is done, New Shoreham offers a muted, but convivial nightlife, featuring several bars and pubs that keep the party going well into the night. But it would be misleading to position Block Island as any kind of nightlife destination. It really isn’t, nor does it try to be. It is, quite simply, the glorious beach getaway that nature intended it to be. And that’s more than enough to keep visitors coming back for more, year after year. Access to Block Island is only by sea or air, naturally. Many visitors arrive on private boats and yachts, heading for one of the two excellent harbors and marinas on the island, one on each side. Year-round ferry service is available from Port Judith, Rhode Island, and offers the only ferry that permits automobiles. Faster catamarans can speed you to Block Island from Port Judith, or from New London, Connecticut. In the summer, a ferry from Montauk, on the tip of Long Island, can get your there in an hour. The island is also served by commuter plane from Westerly, Rhode Island, or by private plane from any location. No matter how you arrive on Block Island, be sure to give yourself a few days in this Atlantic paradise. Once you begin to unwind and relax, Block Island-style, you won’t be in any hurry to leave.